This April will mark the 100th birthday of Tel Aviv. Established in 1909 on the sand dunes north of the ancient city of Jaffa, Tel Aviv was established by Jews wanting to escape from the overcrowded area which now makes up just a small district of modern Tel Aviv. Originally designed to be a suburb, a master plan was drawn up based on European cities of the time. Wide boulevards, eclectic and later Bauhaus style architecture were brought to Tel Aviv by the immigrants who came from Germany and Austria. The city grew and grew, and continues to grow. It is today the Mediterranean Capital of Cool with a phenomenal night life, beach life, cafe and restaurant culture, as well as a great climate, awesome museums, and fantasticly cool people. And, it is the center of the second most important region in the world for hi-tech industry after Silicon Valley, California. 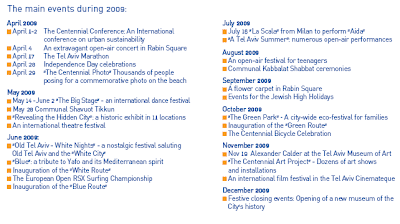 The centennial makes 2009 the perfect year to visit Tel Aviv. Below is just a selection of the events taking place between April and December. There really is something in there for everyone! The full program of events can be found here. For more information on Tel Aviv you can see the huge number of pages we've written about it at www.touristisrael.com/telaviv.html. And to help you get there, we've just launched a new site cheapflights.touristisrael.com with all the best deals on flights to Israel. We've been quiet on this blog for a few days whilst we've got our newest site going, Cheap Flights to Israel is a new part of our site where we show you the best fares to Tel Aviv. Currently we're covering flights from the US, UK, and Canada, but this will soon expand. Okay, we were surprised when we first heard about this too. Israel may be a liberal and fun-loving country, but what happens annually in Eilat takes this to a new level. Israel's southern-most city on the Red Sea hosts the International Belly Dance Festival each and every year. People travel from across the world to this festival which 'explores belly dance from a number of cultures.' Its happening this weekend 22-24 of January at, of all places, The Golden Tulip Club Hotel! The festival consists of three major components: workshops, performances and a competition. International experts in a wide array of Oriental and Eastern dances will teach classes of all levels in their respective areas of expertise. In the evening, the visiting artists will perform either solo or with their companies. And finally, an international competition in which dancers from Belgium, France, Israel, Russia and Germany will face off in order to win a prestigious invitation to The Oriental Bazaar Festival in Berlin will take place throughout the weekend. Between festival activities, participants will be invited to stroll through a bazaar of goods from around the world. Egyptian music, Turkish costumes, Indian jewelry and many other finds will be on sale during all three days of the festival. The workshop element of this particular festival in especially intriguing. Over 20 teachers from abroad will join Israel's finest experts in Oriental and Asian dance to bring belly to the public. For the first time ever, international success Magdy el Leisy will visit Israel. Leisy is of Egyptian origin and has, until this point, not been able to attend the festival for various reasons. This year, despite the recent tensions, Leisy decided that the moment had come to see Israel. Joining him on the guest list is Mayodi, an esteemed Muslim dancer, who will be making his second trip to Israel for the festival. Mayodi is of Moroccan origin and has been performing throughout the Middle East for many years. Until recently, Israel was not included in that list. However, Mayodi explained that art was not political; rather, it is international and should be treated as such. This festival's outstanding program proves that Mayodi is far from alone in this belief. For those who would like to participate in the festival, there is still room at the hotel for new reservations. And for anyone who is in Eilat anyway, stop by to take in some truly extraordinary performances. Unexpected to some, Israel never caeses to surprise! That's why you need to go and be cool there! It is now confirmed that 2008 was Israel's record year for tourism with over 3 million tourists visiting. They came for all sorts of holidays, from visiting the ultra-cool city of Tel Aviv which saw record visitor number itself, to religious pilgrimages, adventure holidays, beach holidays, and just about everything else possible. Ben Gurion Airport also saw a record year in terms of passenger numbers - 10% more than the year before. All of these statistics might seem boring but they are absolutely fantastic bearing in mind there is a global economic crisis! Hopefully 2009 will see more people realise the attraciveness of Israel as a place to go on holiday. More flights are on the table, including El Al to Sao Paulo, Brazil, the first flights to South America, and US Airways to Philadelphia. Tel Aviv is marking its 100th year anniversary this year and a year of parties and events plans to make this an even more exciting year to be in what the New York Times last year described as the "Mediterranean Capital of Cool." If the many Hollywood and music stars who visited Israel last year, from Ben Stiller and Zach Braff, through to Paul McCartney, this year will see, amongst others, the Pope coming! 2008 was definetely a great year for tourism to Israel - and we hope 2009 will be even better. So Wallpaper magazine, perhaps the best and most well-regarded design magazine, has just named Tel Aviv as one of its top cities of 2008. As a nominee for the Best City of 2008 award, it is up against Chicago, Mumbai and Shanghai for the award. We think it should definetely win. Tel Aviv is a designer city. Its architecture is world renowned, so much so that one of the newest pages on the site is about just that - click for more. To see the Wallpaper piece on Tel Aviv click here.